Telephone Tales, written by Don Conrad and published by Dog Ear Publishing, not only gives readers a glimpse at the history of the telephone, but it also tells the stories of some of the individuals who worked on telephones. The telephone has been an essential part of our lives from the time it was invented by Alexander Graham Bell. Over the years, the size, shape and technology of the telephone has changed considerably. For as long as the telephone has been in existence, countless men and women have worked behind the scenes to ensure that connections are made, lines are installed and repaired, and the design is improved. In Telephone Tales, author Don Conrad, a long-time employee in the telecommunications industry himself, pieces together true short stories about the people who worked on telephones. From neat and tidy switchboard operators to big and burly linemen, the people of Conrad’s stories shine a light on the action behind the scenes of the telephone industry. Telephone Tales is an interesting read about the history of the telephone as well as a tribute to all of those who spent their lives working in the industry. For more information, please visit the author’s website at www.ConradDon.com. Possessions, written by Carmen de Monteflores and published by Dog Ear Publishing, tells the story of Meli and Lila, the Puerto Rican grandmother and her estranged American granddaughter. When Lila meets the feisty Josefina, a fellow graduate student at Berkeley who is proud of her Latina background, she gets inspired to contact her grandmother. Lila and Meli meet for lunch and take up where they left off fifteen years ago. As Meli begins to tell Lila the story of her life, Lila finds herself intrigued with this new side of her grandmother that she never knew. When Meli was a young woman, she left Puerto Rico and came to the United States to study art in New York City. Despite her introverted nature, she makes a few friends during her stay there. But when she meets Lila’s grandfather, Meli marries, moves to Montana and has a child. Lila is left with more than a few questions: what happened during her time in New York to make Meli leave everything and start a new life? And more importantly, why did Lila’s mother cut off all ties with Meli? Just as Meli and Lila are becoming close again, Meli dies unexpectedly and bequeaths all her possessions to Lila. As she digs through the endless mounds of clutter at her grandmother’s house, Lila slowly begins to discover the truth about Meli’s past. Eventually Lila confronts her mother about Meli and at the same time, Lila’s relationship with her friend Josefina undergoes an unexpected transformation. Possessions, by author Carmen de Monteflores takes the reader on a narrative journey from Puerto Rico to New York and from Montana to northern California. Surprisingly, the more Lila learns about her grandmother’s secret history and her passion for art, the more she learns about herself and her own desires. For more information, please visit the author’s website at www.possessionsthenovel.com. Written by Georgia Ann Mullen and published by Dog Ear Publishing, A Shocking and Unnatural Incident is the first novel in the Canal Tales series by author Georgia Ann Mullen. In it, the lives of three girls reflect the three issues spawning the women’s rights movement in Seneca Falls, New York in 1848: abolition, temperance and female sovereignty. Tomboy Tess wears pants, spits, fights boys and yearns for independence and adventure along the Erie Canal. Beany is the shy daughter of August, a runaway slave who works for Tess’ family. Lucy is the ambitious daughter of a wealthy family who wants to attend college and become a lawyer, but her father expects her to marry one instead. The girls have nothing in common until they become enmeshed in Elizabeth Cady Stanton’s First Woman’s Rights Convention taking root in Seneca Falls. They become friends when Amelia Bloomer takes them under her wing, offering them employment and emotional support at The Lily, her temperance and women’s rights newspaper. Things turn serious when Tess’ alcoholic and mean-spirited father turns Beany and her mother over to slave catchers. Tess and Lucy team up with Tess’ brother Cooper to free them from jail. This adventure brings about catastrophic consequences and Tess finds herself together with Coop and Beany adrift on a boat in the Erie Canal facing the unknown. The characters in A Shocking and Unnatural Incident will capture your attention and your heart from the first pages. Georgia Ann Mullen brings the issues leading up to the women’s rights movement to life in this vivid coming-of-age story of friendship set against the backdrop of abolition, temperance and the early Women’s Rights Movement. For more information, please visit the author’s website at www.historicalfictionbook.net. The Coming of Vines, written by Bonnie Claire Lanese and published by Dog Ear Publishing, tells the story of a young woman coming face to face with a secret history that will change her life. Young, single and attractive Lille lives a comfortable city life in St. Petersburg, Florida. Her father left when she was a child, and her mother died of cancer, leaving Lillie with no family ties or obligations. However, when she receives a desperate letter from her mother’s dear friend Sophie Day, a woman who Lillie has long considered her aunt, she rushes to the small, rural town of LaBelle, Florida, where Sophie resides. There she is confronted with an ailing Sophie, a shadow of her former robust self. Lillie also meets Katie, a dear and boisterous friend of Sophie’s. Over the next few days, the two women become friends and Katie tells Lillie about Sophie’s life. Lillie also talks with Sophie and reads her old journals, and thus finds herself engulfed in a drama that unfolded long ago. The Coming of Vines, by author Bonnie Claire Lanese is a powerful novel. Sophie’s heartbreaking story reveals much about small town life in the rural South. Flooded with memories from her own childhood, Lillie moves back and forth in time from days she and her mother spent with Sophie and a time when Sophie and Katie were girls, where events passed that have been kept secret for a long time. For more information, please visit the author’s website at thecomingofvines.com. 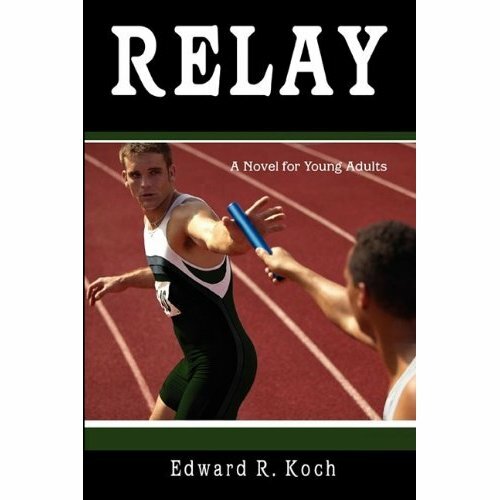 Relay, written by Edward R. Koch and published by Dog Ear Publishing, is an authentic fiction about the world of high school track and field. Green Ridge High School has a history of winning track & field championships, but when most of the track stars graduate, the team is left struggling to continue its status as a serious contender to win the state title. Coach Bill Mallory, a wise man with years of experience, has confidence in his team. Junior Ted Stewart and his buddy Josh Johnson have followed in their families’ tradition as track athletes at Green Ridge. Ted wants more than anything to bring his team to victory but in the meantime, he has to put up with his teammate Sonny Lamar, who is anything but a team player. Relay, by author Edward R. Koch, is a fictional story intended for young adults. Anyone who has been part of a high school team will identify with Ted and his teammates as they work towards their goal of beating their archrival Riverside High. Koch is no stranger to the world of track and field and his own life experience as a competitor and a track official brings authenticity to this tale of teenage athletics. For more information, please visit the author’s website at http://www.edkochbook.com/. Available at Ingram, Baker&Taylor, Amazon.com, Barnes&Noble, Borders and fine bookstores everywhere. Leadership in Action: A Handbook for Leadership, written by Ashley Goldsworthy and published by Dog Ear Publishing, is an indispensable tool for people wanting to become better leaders. Is there such a thing as a born leader? Or is leadership something one can learn? In his new release, Leadership in Action, author Ashley Goldsworthy shatters some of the common myths about leadership, defining it as a process rather than an inherent characteristic. Goldsworthy writes that leaders “…come in all shapes and sizes, all ages and race, men and women and with an infinite diversity of skills, experience and backgrounds.” According to Goldsworthy, the process of leadership is not simply having charisma but rather it is the practice of getting people to do something they wouldn’t normally do without your intervention. Goldsworthy draws on his extensive life experience in leadership positions to write about the theoretical and practical aspects of leading people. The result is Leadership in Action, an invaluable handbook for anyone who wishes to learn more about the process of guiding and motivating others. Author Ashley Goldsworthy has been CEO of Australia’s largest construction company and Dean of the Business School of Australia’s first private university. During his 55 year career he has also been CEO of a bank, deputy CEO of a large insurance company, and chairman of several companies ranging across human resources, accounting, healthcare, vocational education and training, and computer services. He has a uniquely diverse background, with degrees in Accounting, Business, Public Administration, Theology and Science. For more information, visit the author’s website at www.thesecretsofleading.com.